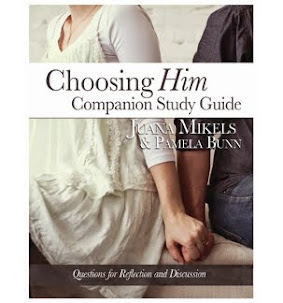 JuanaMikels.com: Choosing Him Marriage Blog Tour! We are thrilled to share this wonderful community of Christian bloggers whose desire is to share Christ's light on Internet, who have come together to share that the Gospel of Jesus Christ changes lives and marriages as it did mine. 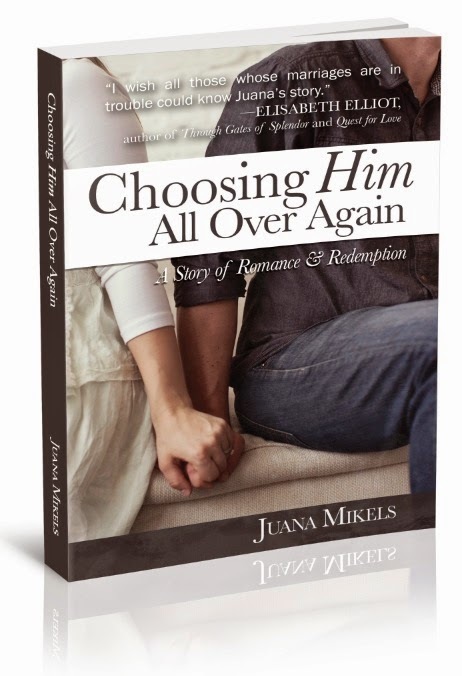 Thank you for joining us for the Choosing Him All Over Again Book Blog Tour (January 5 - March 1, 2015) Thank you for joining me in sharing the good news on the web that we have for hope for marriages through Christ. Link up your post and we'll make sure to share it on all our social media! Want to participate in the blog tour? CLICK HERE! (http://www.juanamikels.com/p/for-bloggers.html) for all the details! 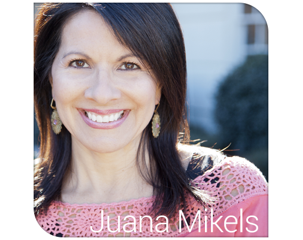 JUANA MIKELS’S DESIRE IS TO see women’s lives changed through the Gospel of Jesus Christ. Juana speaks to women’s groups and churches with her story and seminar on order, home life, and time management for busy Christian mothers. Formerly a National Account Manager with Xerox Corporation, she left the work force to be a stay-at-home mom and homeschooled her children. Juana’s experience in both business and homeschooling gives her an excellent background to understand and help other busy moms. Juana, her husband, Terry, and their four children live in Raleigh, North Carolina. You can also find her on social media under the profile JuanaMikels. Her blog is at www.choosinghim.com. 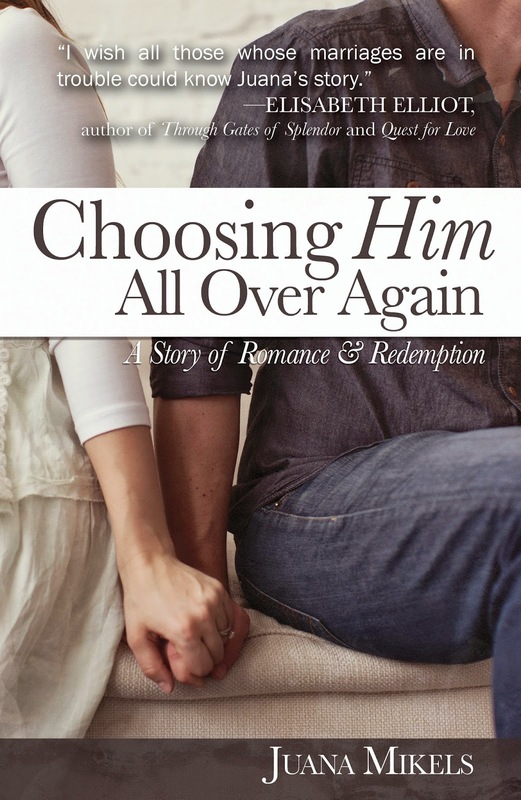 “A stirring love story beginning with Christ’s pursuit. “Dumping her husband for the ‘good life,’ Juana Mikels decided she could create a much better life on her own, so she took off . . . heading the wrong way down a one-way street. Then Juana crashed . . . right into Jesus and His plan for her life. “Juana opens your eyes to truth, bringing tears to your eyes yet joy to your heart. 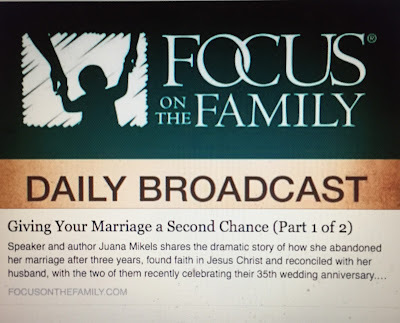 “Juana’s story brings light and hope into God’s design for marriage. If you are less than content in your marriage, I encourage you to open the pages of this book and allow God to minister to your heart. It is my belief that those who read the words of Juana’s heart will be taken on a journey that will strip you down bare—allowing God to make you whole—and in turn make your marriage all you desire it to be. 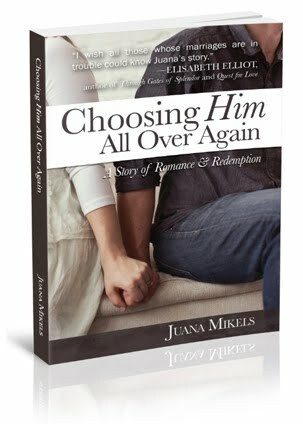 You can order off Amazon HERE (http://www.amazon.com/Choosing-Him-All-Over-Again/dp/1620202913) or at your local bookstore!